Mixing Assistant : Neil Perry. Music Supervisor : Kathy Nelson. Billy Corgan - Spiders. Executive Producer : Brian Grazer. Engineer : Shawn Murphy. Producer : Billy Corgan. Executive Producer : Scott Rudin. The Amazing Spider-Man. Title:The Amazing Spider-Man. Your item will be previously owned but still in great condition. The disc will play perfectly without interruption and the case, inlay notes and sleeve may show limited signs of wear. Disc Condition- VG- Disc has light surface scratches/marks and plays perfectly - Complete with Case, Original Insert & Booklet. WE WILL REPLY AS SOON AS POSSIBLE BUT MAY NOT ALWAYS BE ABLE TO RESPOND AT WEEKENDS. Format Album. / BB´S 4-30 CD = 8?. Essi offrono qui su un CD. Also includes dialogue from the film traditional Scottish bagpipe music. 68 minutes long. A 128kb download from iTunes is only 9% of the quality of a CD (1,400 kb per second). If you love music then do your ears a favour and choose a CD. Your item will be previously owned but still in great condition. The disc will play perfectly without interruption and the case, inlay notes and sleeve may show limited signs of wear. Product Details. Format: Import. Format : Import. Condition : Good. Product Category : Music. Binding : Audio CD. Release Date : 1992-05-06. Label : Intrada. ℗ © 1993 Varese Sarabande Records, Inc. Format: CD, Album, Stereo. Chase Through The Park. Condition – The booklet is all in great condition. No other scratches, cuts, tears or holes. One hairline mark on CD (so listed as 'very good' overall). In very good condition this is the Soundtrack to the film Braveheart, with music by James Horner and played by the London Symphony Orchestra. PayPal please and I will post as soon as the funds have cleared. James Horner - Braveheart (Original Soundtrack) CD. Condition is Very Good. Dispatched with Royal Mail 1st Class Large Letter. Label Varèse Sarabande. Ausländisches Produkt Ja. Format Album. Small bit of wear on insert from the case holder. Some scuffs in case. Disc like new, disc plays perfect. Please see my feedback and other listings. The Mask of Zorro: Music from the Motion Picture. Title:The Mask of Zorro: Music from the Motion Picture. Your item will be previously owned but still in great condition. The disc will play perfectly without interruption and the case, inlay notes and sleeve may show limited signs of wear. Out of print, genuine Sony Classical CD in good condition. A More Normal Life. Hope vs Escobar. A Cry for Help. Format: CD MOD. Release Date (Data di uscita): 18 Jun 2013 (18 giugno 2013). Playtronics Break-In. Planning the Sneak. The Hand-Off. Legends of the Fall 4:17. Isabel's Murder, Recollections of Samuel 3:58. Alfred, Tristan, The Colonel, The Legend 15:07. To the Boys 2:48. Ludlows 5:40. Goodbyes 3:11. Revenge 6:20. Formato del prodotto: CD. Format: Audio CD. Release Date: 2018-08-10. Condition: New. "The Wooden Horse And The Sacking of Troy". CD IN A. AND YOU ARE HAPPY. THAT WAY I KNOW YOU HAVE RECEIVED YOUR ITEM. £2.00. R.O.W. £5. 50. ! VERY GOOD CONDITION . "Briseis and Achilles". Horner's lush and tuneful orchestrations often emulate Spielberg's favorite composer, John Williams. ~ Evan Cater. Record Label : MCA. Lyricist : Cynthia Weil. Engineer : Alan Rouse. London Symphony Orchestra - Main Title 5:07. 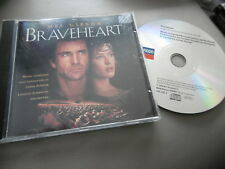 Braveheart CD very good condition. From smoke and pet free home. Any questions feel free to ask. The Humanoids Attack (2:49). Humanoids 1996 Part #1 (4:20). Humanoids 1996 Part #2 (3:59). Humanoids 1996 Part #3 (4:35). Release Date (Data di uscita): 18 Sep 2015 (18 settembre 2015). Format: CD. The 'Buck-O' (3:40). Format: CD. Release Date (Data di uscita): 26 Jul 2011 (26 luglio 2011). A Kaleidoscope of Mathematics. The Mask of Zorro. For the Love of a Princess. Legends of the Fall. Bird of Prey Decloaks. Charging For Wagner. Titanic Orchestra - Rose 2:52. Salonisti, I - Valse Septembre 3:40. Lista di canzone - 2. BOTH CD AND INSERTS ARE IN GOOD CONDITION. The Ludlows (From Legends Of The Fall). Format: CD. Release Date: 23/09/2016. Conquest Of The Air (From First In Flight). Catalogue Number: 4812810. Iris: Part 1 (From Iris). Kitty Hawk (From First In Flight). BOTH CD AND INSERTS ARE IN GOOD CONDITION,COUPLE OF CRACKS ON FRONT OF JEWEL CASE. Distributors in the UK. Region C/3: India, Nepal, Mainland China, Russia, Central and South Asia. Here he skillfully sets the scene with the heraldic opening salvo of "3200 Years Ago," followed by the shining city splendor of "Troy.". Assistant Music Editor : Barbara McDermott. Music Preparation : Bob Bornstein.